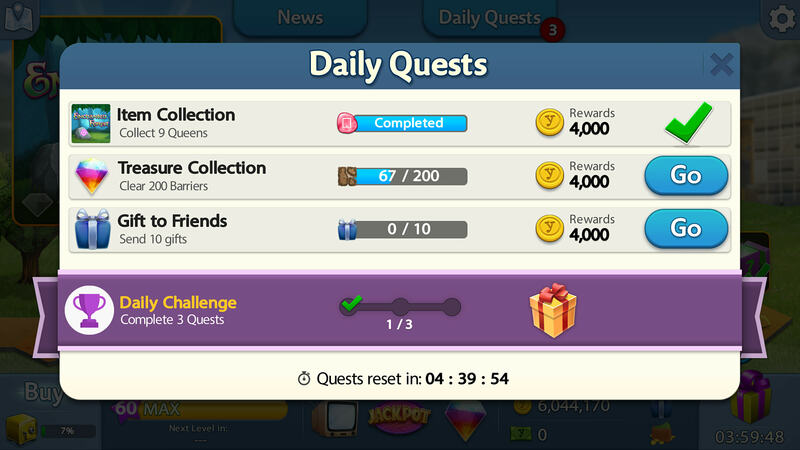 Once again GIFTS are part of the Daily Quest .. and AGAIN the system is NOT sending gifts. I've received maybe 5 today, and you've only sent three or four. So AGAIN I will not be able to complete the Daily Quest and lose BOTH the bonus for that task AND as it is part of the DAILY BONUS three .. no bonus will be paid out. I do not like that we cannot initiate and send gifts ourselves. ???? Why is this ???? Whether or not we can complete the Daily Quests is lost when the system does not "cooperate". It's "funny" not ha ha, that yesterday when gifts were not part of the Daily Quest, at least one gift went out each time I signed on and I'm sure more than 10 went out through the day. Either fix this or do not include it with the Daily Quest bonus. Dottie YoC (14296735) wrote: Once again GIFTS are part of the Daily Quest .. and AGAIN the system is NOT sending gifts. I've received maybe 5 today, and you've only sent three or four. So AGAIN I will not be able to complete the Daily Quest and lose BOTH the bonus for that task AND as it is part of the DAILY BONUS three .. no bonus will be paid out. I do not like that we cannot initiate and send gifts ourselves. ???? Why is this ???? Whether or not we can complete the Daily Quests is lost when the system does not "cooperate". It's "funny" not ha ha, that yesterday when gifts were not part of the Daily Quest, at least one gift went out each time I signed on and I'm sure more than 10 went out through the day. Either fix this or do not include it with the Daily Quest bonus. I don't have any issues with this. It can be a bit frustrating though waiting for people to request gifts. If there is No Gift Request's pending I log out of the app and clear it. I then go back in and there is usually a few request's for gifts that I can send. This may take a few trues, but eventually I get the Quest completed.You can also send the gifts in the YoWorld game now, too. Since the add on of levels I also have had a major issue with the gift system. Before I had a bazillion gift requests and no problem reaching 10 within a few hours each day. I thought I was the only one having this issue. I agree and they should not be part of the quests. Ever since the last update, I've had nothing but issues with the gifts. I get very few of them now. Why, please? I am able to ask for gifts for me but am not seeing any requests for gifts from anyone else....!!!! They need to remove that from the list of requests or let us add the gifts we got in with the mix. That might help. I have to agree with the above postings. No ads to add coins, meeting the challenges often costs more than the prize and now the gifting system isn't working correctly so that you cannot collect the daily bonus. When I try to send gifts requested within YoWorld, more often than not after sending one, it will message that I have already sent the maximum # on the 2nd. They don't seem to cross over to the mobile companion either. What's the point of this? Not glad others are having gifting probs, but glad it’s not just me. I thought I was doing something wrong. Marilyn (104576654) wrote: I have to agree with the above postings. No ads to add coins, meeting the challenges often costs more than the prize and now the gifting system isn't working correctly so that you cannot collect the daily bonus. When I try to send gifts requested within YoWorld, more often than not after sending one, it will message that I have already sent the maximum # on the 2nd. They don't seem to cross over to the mobile companion either. What's the point of this? Ok, BVG, enough! Yesterday within the YoWorld game itself, I had one gift request. This evening there were actually 4. However, none, zip, zero could be returned to players. Same old, same old tired message.... you have already sent the maximum... when I had been able to send none.... not a one. If y'all can't seem to get it to work correctly, take it out of the game. Seriously FUBAR as is. I agree with everything here. I thought it was going to be great having the daily challenge as an extra incentive if you complete the quests, but with the gifts and the coin bonus included in the challenge, it makes it nearly impossible for me to earn it. I can only log in once or twice a day and that used to be enough, but not any more. It's hardly worth it now. May we receive new gifts? I have a lot of Hosta plants,black sinks,clothes rack n etc... Tysvm. I have to agree. I can finish all challenges except for the one with sending gifts. Every single time that is part of the challenge, I get no requests to send gifts to. If gifting isn't required, then I have tons of requests. I have never fulfilled the send gift challenge since it began.. although i have about 3o friends playing on it, i have only ever received 5 at the most.. requests, very frustrating, usually only get 3 requests daily.. this should not be part of main challenge, but made a bonus on the side, not being able to complete this challenge option when part of daily larger challenge, means miss out on larger prize. am i to understand.. one can only send 5 gifts per friend in total? and the daily time frame is not 24 hours like other parts of challenge are? Same here. I never have friends requesting gifts, if I do the most is maybe four in a day. Then there are the times when I click to send someone a gift it says I've sent the max for the day...you know after I've sent one. They really need to fix this. I too have problems with the sending gifts in the challenges and wish it was taken out or give us the opportunity to initiate sending the gifts to our friends in the app. I most always complete the challenges except for when gifting is involved. This has happened to me several times. It seemed to have been working fine recently but tonight I'm having this issue again. This happens every single time we need to send gifts. Every time. I don't even bother worrying about completing. I just get my log in and leave. 19 1/2 hours after reset yesterday and I haven't had one single gift request to send. Any other time I am loaded with requests.